Burbank, Calif. - The Walt Disney Studios proudly announces the addition of BAMBI to its coveted, cutting-edge Blu-ray™ Diamond Collection line-up of Disney’s greatest animated-classics. 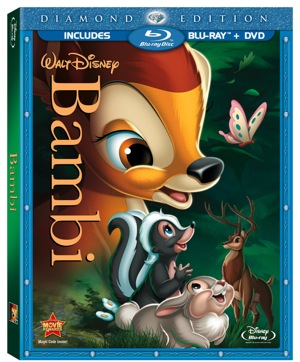 Released from the Disney vault for a limited time only, BAMBI Diamond Edition features the loveable and adorable wide-eyed fawn and his forest friends in Blu-ray high-definition on March 1, 2011. The Diamond Edition debut of BAMBI, Walt’s fifth full-length animated classic, is an endearing tale about a young prince of the forest who learns valuable life-lessons about friendship, love, and the miracle of life. The movie is a must-own coming-of-age story that Walt Disney Studios Home Entertainment has especially packaged with families in mind - providing the ultimate, interactive hi-def home entertainment experience with a newly enhanced digital restoration, enhanced picture and sound, games, activities and more. As morning light breaks across the meadow, a young deer named Bambi is born and hailed as ‘Prince of the Forest.’ Soon Bambi emerges from the thicket on wobbly legs, much to the delight of his new friends, Thumper, the playful rabbit, and Flower, the bashful yet lovable skunk. But the fun of nibbling on fresh blossoms and frolicking through the woods is only the beginning. Exploring his new world, and guided by the wisdom of Friend Owl,Bambi learns valuable life lessons with every adventure – experiencing the power of friendship, family, and love along the away. BAMBI was nominated for three Academy Awards® for Best Song (“Love Is a Song,”), Best Sound Recording, and Best Music Score of a Dramatic or Comedy Picture. To date, BAMBI is No. 3 on the list of American Film Institute’s Top 10 Animated Films of All Times. And in 2004, the movie was commemorated with a first-class U.S. postage stamp and in the 1990’s the film inspired astronomers to name a pair of asteroids after the adorable characters – Thumper (April 20, 1993) and Bambi (October 17, 1995). · Inside Walt’s Story Meetings-Enhanced Edition - A fascinating, multi-tiered, interactive story-telling experience. Go back in time with dramatic voice re-enactments of the moments with Walt that led to the creation of this classic film. · Blu-ray Galleries—A collection of the extraordinary images originally created as part of the design process for BAMBI. · Disney’s Big Book of Knowledge: BAMBI Edition— An interactive educational gaming experience that uses the film as a learning tool. Players can customize their own Big Book of Knowledge and learn all about forest creatures, seasons andmore! Each time a player completes a task, they are rewarded with new stickers to decorate their Big Book of Knowledge. · The Making Of BAMBI: A Prince Is Born—A comprehensive look at the making of BAMBI covers the story, the characters, the actors, the art design, the music and the history of Walt Disney’s classic film using behind the scenes footage, production stills, animation, artwork and multiple interviews withperformers and behind the scenes participants. · Tricks of the Trade (excerpt)—In an episode from the 1957 Disneyland TV show, Walt narrates the story of the multiplane camera, an animation innovation crucial to the production of BAMBI. · Inside the Disney Archives—Disney Supervising Animator Andreas Deja guides viewers through Disney’s Animation Research Library, where artwork from past Disney animated feature films is stored, including early story sketches of Bobo the rabbit,” (who became Thumper), glass paintings made for the multiplane camera and more. · The Old Mill—Winner of the 1937 Academy Award® for Best Short Subject/Cartoon, The Old Mill was a testing ground for several techniques critical to Walt’s artistic vision for BAMBI, including the multiplane camera, animating realistic animals and experimenting with such natural occurrences such as wind, rain and lightning. Disney’s Blu-ray™ Diamond Collection represents The Walt Disney Studio’s most prestigious animated classics. The Collection will be comprised with many of Walt Disney’s most treasured animated classic titles to be released through 2016. These titles represent the highest level of picture and sound, feature groundbreaking, state-of-the-art immersive bonus content, and include unprecedented levels of interactivity, personalization and customization, made possible because of Blu-ray technology. For more than 85 years, The Walt Disney Studios has been the foundation on which The Walt Disney Company (DIS: NYSE) was built. Today, the Studio brings quality movies, music and stage plays to consumers throughout the world. Feature films are released under four banners: Walt Disney Pictures, which includes Walt Disney Animation Studios and Pixar Animation Studios, Disneynature, Touchstone Pictures and Marvel. Through the Home Entertainment division, innovative distribution methods provide access to creative content across multiple platforms. Original music and motion picture soundtracks are produced under Walt Disney Records and Hollywood Records, while Disney Theatrical Group produces and licenses live events, including Broadway theatrical productions, Disney on Ice and Disney LIVE! For more information, please visit www.disney.com.